v OLAP (online analytical processing) is computer processing that enables a user to easily and selectively extract and view data from different points of view. v For example, a user can request that data be analyzed to display a spreadsheet showing all of a company's beach ball products sold in Florida in the month of July, compare revenue figures with those for the same products in September, and then see a comparison of other product sales in Florida in the same time period. 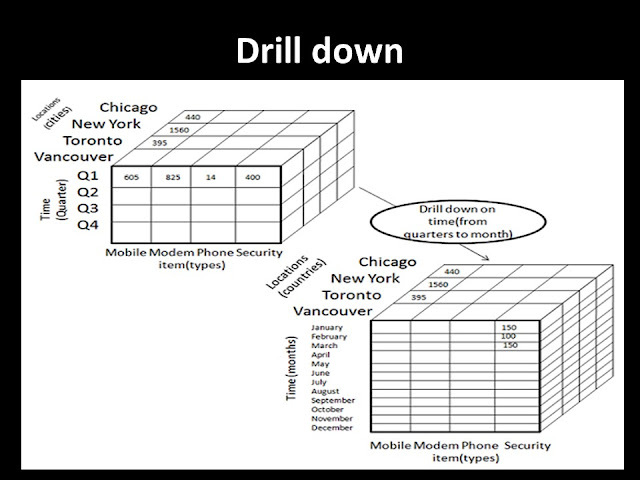 v To facilitate this kind of analysis, OLAP data is stored in a multidimensional database . v Whereas a relational database can be thought of as two-dimensional, a multidimensional database considers each data attribute (such as product, geographic sales region, and time period) as a separate "dimension. v An OLAP database does not need to be as large as a data warehouse, since not all transactional data is needed for trend analysis. 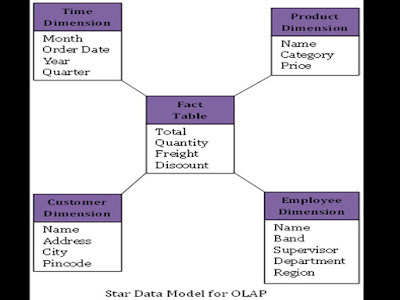 v Using Open Database Connectivity (ODBC), data can be imported from existing relational databases to create a multidimensional database for OLAP. The supervisor that gave the most discounts. The quantity shipped on a particular date, month, year or quarter. 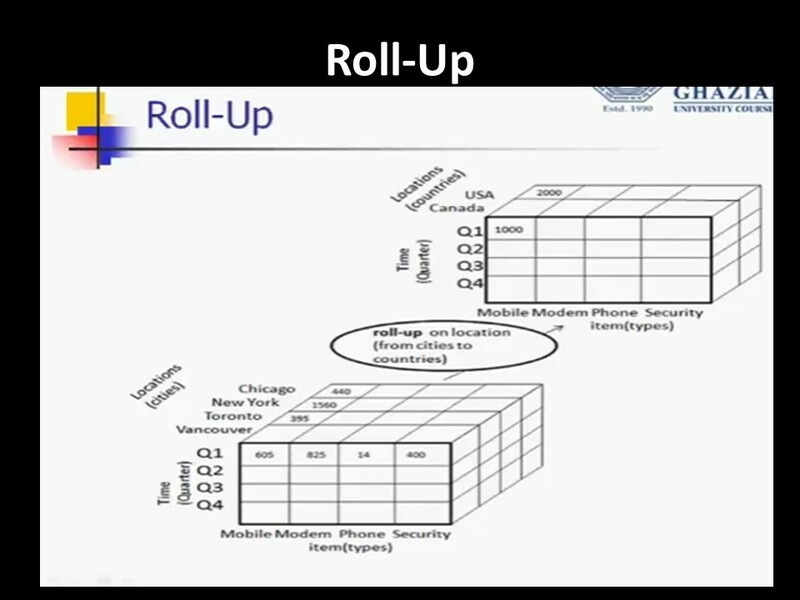 • To obtain answers, such as the ones above, from a data model OLAP cubes are created. 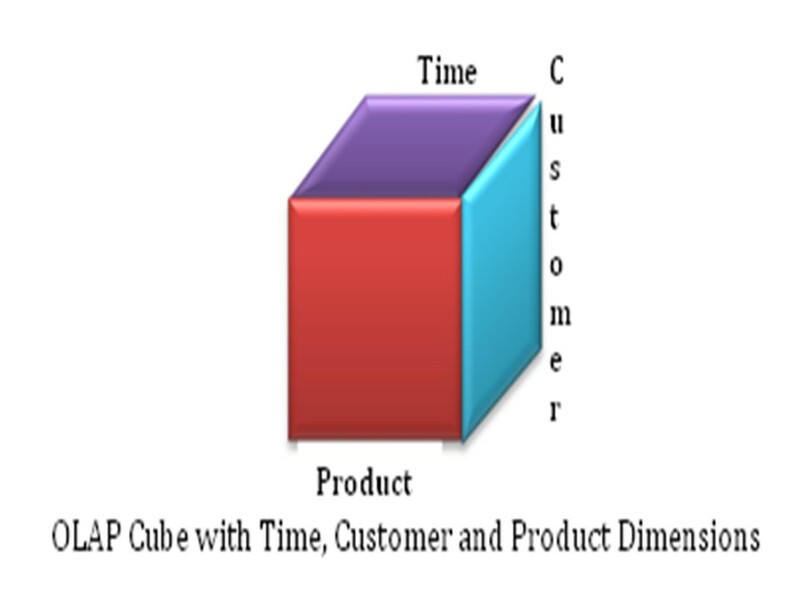 OLAP cubes are not strictly cuboids - it is the name given to the process of linking data from the different dimensions. • Real World Example: In a hospital there is 20 years of very complete patient information stored. Someone on the administration wants a detailed report of the most common diseases, success rate of treatment and a lot of relevant data. For this, we apply OLAP operations to our data warehouse with historical information, and through complex queries we get these results. Then they can be reported to the administration for further analysis. How is OLAP Technology Used? 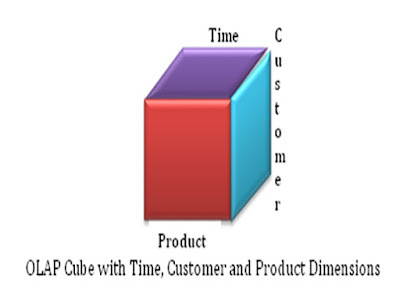 v OLAP performs multidimensional analysis of business data and provides the capability for complex calculations and trend analysis. v It is the foundation for many kinds of business applications for Business Performance Management, Planning, Budgeting, Financial Reporting, Analysis, Knowledge Discovery, and Data Warehouse Reporting. v OLAP enables end-users to analysis of data in multiple dimensions, thereby providing the insight and understanding they need for better decision making. 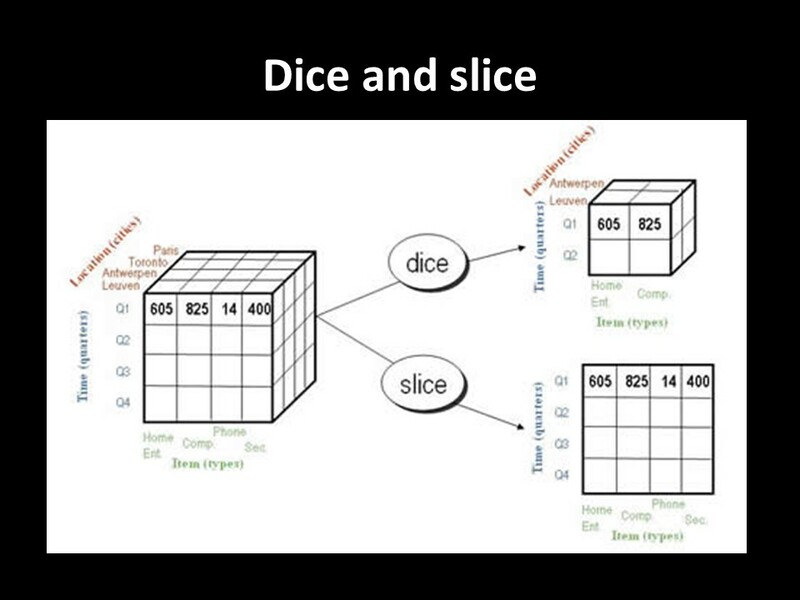 • Slice : It will form a new sub cube by selecting any one side of dimension. 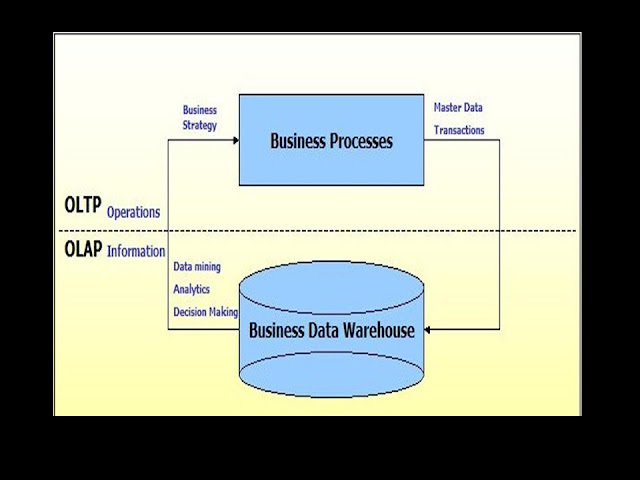 • OLAP is valuable because of its flexibility. 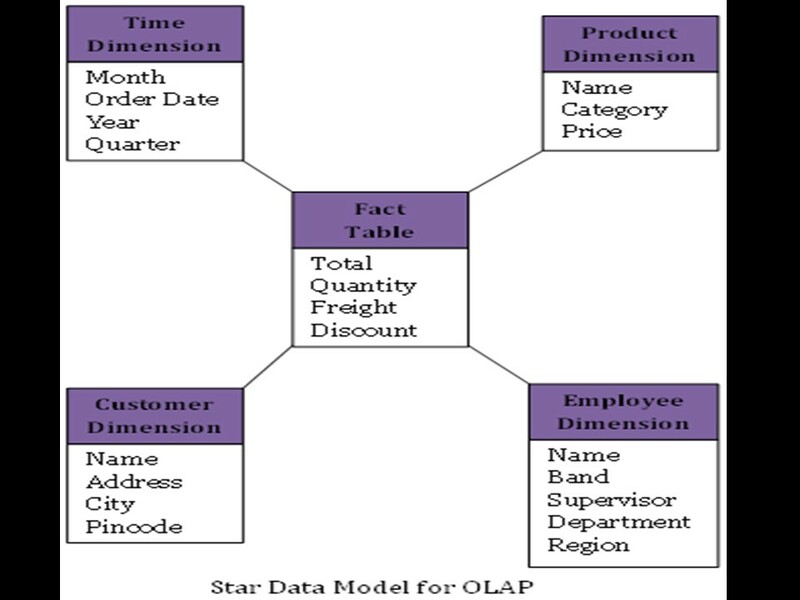 Once the facts and dimensions are defined within the OLAP server, OLAP tools provide an easy way to analyze data by simply dragging and dropping dimensions and facts into the appropriate locations. • It helps in decision making process and problem solving. • OLAP is used for Querying processig. • It maintains information about the complete organization. • It store historical data. • OLAP creates a single platform for all the information and business needs, planning , budgeting , forecasting , reporting and analysis.